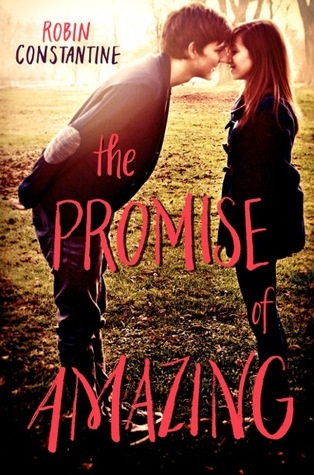 I've been trying to figure out how to write my review for The Promise of Amazing for some time now. If you were to ask me whether or not I enjoyed it, I'd immediately start to open my mouth to answer 'yes'... only to hesitate and mull over my answer some more. You see, overall I did like the book, but the thing is, there are just some facets and details that I wasn't just fond of, and ultimately, those are what stuck to me. Moreover, I guess I was expecting a bit too much from the book - the cover is all sorts of gorgeous, I absolutely loved the title, and blurb, for the lack of a better word, seemed promising. While I wouldn't say that The Promise of Amazing is a disappointing read, I wouldn't exactly say that it's something that I would come back to and read again. As I have mentioned, there are parts of the book that I really liked, and one of those is how the MC, Wren, and the love interest, Grayson, met. Talk about original! It was something new, something extremely unique, and it also explained just why the two are so immediately attracted to one another. I also liked how relatable Wren was for the most part - here's a young woman who's worried about her future, and who's doing everything in her power to make sure that tomorrow will turn out okay. Here's someone who doesn't know who she is just yet, but is desperately trying to figure that out. And finally, I found the way she acted during her first few interactions with Grayson, and the way she just couldn't stop thinking about him, so endearing, and oh so familiar. She really felt like your ordinary teen. While I do understand where the attraction came from (I'm pretty sure I won't be able to stop thinking about the person whose life I saved / the person who saved me), it was alarming how everything escalated so quickly. After their first interaction, here was Wren, smitten and crushing on Grayson (which is nothing out of the ordinary), but here was Grayson who was just convinced that Wren would change his life for the better, and that she was his savior from his horrible past. I was surprised at how adamant Grayson was that he was in love with Wren... when he didn't even know her! It also irked me that they were professing their love to each other so quickly after their first meeting and after just a few dates - nothing felt natural. Just a heads up, Grayson - you can't always rely on another person to save you. You have to help yourself first. I'm a bit undecided with how I feel about Grayson. He really wanted to change, to move past everything that happened the previous years, and in turn, I wanted to root for him. However, Grayson never did something to actually change - he was so unapologetic about everything wrong that he did, and I couldn't quite get past that. He did nothing but mull about wanting to change... and nothing else! You have to work to get something you want - wanting can only get you so far. I did think that while the insta-love was annoying, Grayson did have his cute moments, and I won't deny that he cared for Wren in his own way. I still don't think that it was love, though. I did like the plot twist - and I'm sure I'm not the only one. It's not a subject matter that I've ever seen in YA, and I was admittedly excited when I encountered it. Through her characters, I couldn't wait to find out how Constatine was going to handle the conflict that arose. This is where I ended up the most disappointed - everything was rushed; nothing was fleshed out. The resolution came so quickly, and next thing I knew, I was almost done with the novel. I truly felt like Constantine could have expounded more on how both Grayson and Wren handled Grayson's past, and in doing so, The Promise of Amazing could have been a stronger novel. Also, I might be alone in this, but while Wren and Grasyon did indeed have a connection, I felt that Wren had more chemistry with Luke, someone from Grayson's past who's hell-bent on getting Grayson back on the road of sheer misdemeanor. Through very few interactions (and I do mean few - I can count them in one hand! ), part of me was already wondering if perhaps this novel would have been better with Luke as a lead. Believe me when I say that his chemistry with Wren is just intense! Overall, I liked The Promise of Amazing just enough. It had its fair share of moments that made me smile and be all giddy, and I finished it in no time. Fans of contemporaries would probably like this novel. Never once did I think that I would have to DNF it - Constantine's writing is strong for the most part, and I have no qualms in saying that I will be checking out all of her future releases. Also, I loved how the title was subtly inserted in the last few paragraphs of the novel! This book seems quite like The Infinite Moment of Us by Lauren Myracle, and I didn't particularly enjoy that so I doubt I'll end up reading this. Though I am pretty curious about this plot twist.. I'm glad you've enjoyed this more than some others I know! Good to know the writing is strong, I might pick up the author's future books too. I've been pretty curious about this book for a while now because of the pretty cover and the unique names of the main characters. However, I've been pretty hesitant to read it because of the mixed criticisms I've seen. I'm going to hold back a little bit longer because based on your review, Wren and Grayson's insta-love sounds irritating as hell.